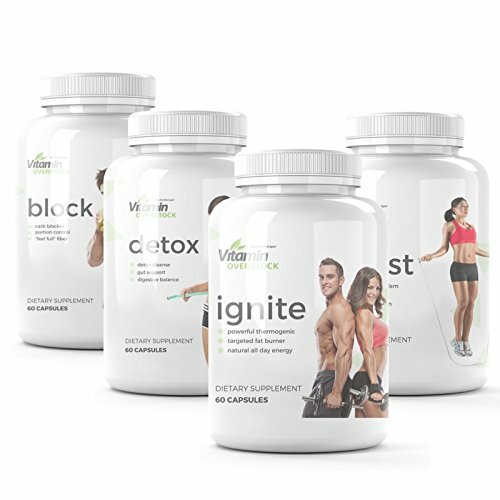 The VITAMINOVERSTOCKTM BEST SELLERS BUNDLE contains clinically proven vitamins, minerals, and superfood extracts to support 360° fat loss and fat loss maintenance, 365 days a year. Thanks to science, being overweight is now optional! Introducing the VitaminOverstockTM Best Sellers Bundle. GMP-certified ingredients. Amazing results. IGNITE contains Bioprene, Yohimbine and other clinically proven ingredients to support natural lipolysis (fat loss). Customers reported improved energy, weight loss, and mood while taking IGNITE as directed. BOOST contains Green Tea, Resveratrol and other clinically proven ingredients to support a healthy metabolism. Customers reported improved carb control, blood sugar, and metabolic rate while taking BOOST as directed. DETOX contains 10 clinically proven ingredients to support digestive balance and colon health. Customers reported improved digestion, water retention, and colon health while taking DETOX as directed. BLOCK contains ingredients clinically proven to induce "fullness," making it easier to eat less and absorb fewer calories. Customers reported improved dieting efforts while taking BLOCK as directed. If you have any questions about this product by Vitamin Overstock, contact us by completing and submitting the form below. If you are looking for a specif part number, please include it with your message.